The intense nationalism fostered by the First World War resulted in many artists turning back to the French artistic heritoge. In essence this meant the classically inspired works of the eighteenth and early nineteenth centuries. Another popular model for contemporary French painters, however, was the work of the eighteenth-century Le Noir brothers Louis and Antoine. The Peasant's Repast, by Louis Le Noin, was a highly respected painting that occupied a prestigious position in the Louvre, It had also inspired the mid-nineteenth century French realist painters Jean Francois Millet, and Gustave Courbet. In 1917 Picasso produced his own version of the work based - albeit loosely - on the famous original. Picasso has retained many of Le Nain's compositional features, especially in the positioning of the main characters. However, some figures ore entirely absent and Picasso has even changed the horizontal format of the original to the vertical. 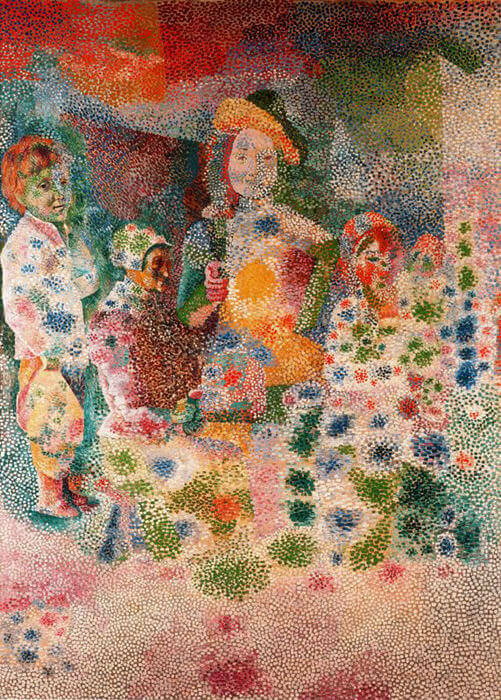 More importantly, Picasso has replaced Le Nain's muted browns with a chromatic explosion of colours, oil executed in a pointillist style. Here Picasso has simultaneously quoted from the past, yet has not abandoned modern developments in painting.